In Stefan Merrill Block’s extraordinary debut, three narratives intertwine to create a story that is by turns funny, smart, introspective, and revelatory. Through the fusion of myth, science, and storytelling, this novel offers a dazzling illumination of the hard-learned truth that only through the loss of what we consider precious can we understand the value of what remains. Stefan Merrill Block was born in 1982 and grew up in Plano, Texas. He graduated from Washington University in St. Louis in 2004. The Story of Forgetting is his first novel. He lives in Brooklyn. The last words of the book are “. . . whatever she needed she had only to imagine.” Why do you think the author chose to end the book this way? How is imagination a central and absolute necessity for the members of the Haggard family? What is the relationship between the fables of Isidora and the rest of the book? How are situations, characters, and feelings from the lives of the Haggard family transformed in these fables? Why do you think that the Haggards maintain this storytelling tradition despite everything that they lose, forget, and abandon? What traditions do you keep that help maintain your own family’s identity? How do your traditions relate to your family’s history? Comparing the Haggard family’s two legacies–the EOA-23 gene and the stories of Isidora–the author writes: “Two ideas, spontaneously improvised, altering in slight ways with each passage, yet remaining, fundamentally, themselves” (p. 175). In what other ways are these two inheritances similar? What is the relationship between them? In what ways are they different? When Jamie leaves home, she leaves a letter for Abel that claims, “life here is no longer possible.” Do you think that if Abel hadn’t told her the truth she would have been able to stay? Do you think that he was right to tell her? In one of the Isidora fables, a group of elders wonder, “To remember nothing . . . what more could one possibly ask of eternity?” (p. 201) Despite the horrors of Alzheimer’s disease, are there ways in which its most well-known symptom, memory loss, is liberating for some of the characters in this book? What do you think of the possibility of there being something positive, even blissful, in the oblivion of Alzheimer’s disease? In certain instances, might it be better to forget? By the end of The Story of Forgetting, Jamie appears desperate to return to her childhood home. Do you think she would have still felt this need if she hadn’t developed Alzheimer’s disease? Was it only after she had forgotten the reasons she had left, and her guilt over abandoning Abel, that she could return? Do you think that eventually she would have returned anyway, even if her memory had not failed? Why do you think that when Paul begins to develop Alzheimer’s disease, he so quickly forgets who Abel is, replacing him with the memory of Jamie Whitman? Do you think there is a way that Paul’s love for his brother remains intact, even after he has forgotten who Abel is? In “Genetic History, Part 3,” the author, describing Paul’s unceasing love for Jamie Whitman, asks if “Love . . . [is] strong enough to gird Memory, at least for a time, against Chance’s inevitable progression” (p. 243). How is love stronger than memory loss in this book? How is it not? Do you think one’s love is made more or less valid if one forgets and confuses its conditions? Have you ever known anyone with Alzheimer’s disease? If so, how does the characterization of the disease in this book relate to your own experiences? How does this characterization relate to depictions you’ve come across in other books or films? Why do you think Seth is so devoted to being a “Master of Nothingness”? Why does he want so badly to disappear? Before Seth and Abel know of each other’s existence, they are already linked by their family’s two legacies: the stories of Isidora and the devastation that the EOA-23 gene has wrought upon their loved ones. What else do Seth and Abel have in common? Might these similarities serve to hint, early in the book, that the two are part of the same family? 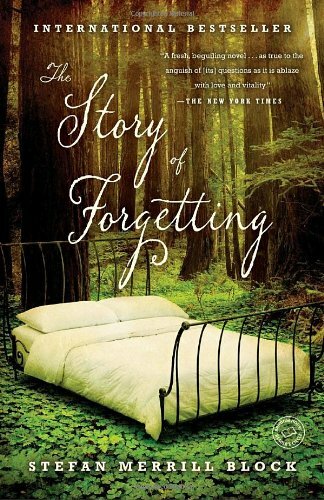 The Story of Forgetting is written in a number of voices, genres, and time periods. Why do you think that the author chose to tell the story this way? How does this style of writing relate to the themes of memory, storytelling, family, and the quest for understanding? Reflecting upon his decision to tell his daughter the truth about his affair with Mae, Abel understands that “out of the possibility of my wrongness in that single moment, I would serve a lifetime of penitence, loneliness, and regret” (p. 264). Do you think that it is strictly guilt that compels Abel to spend twenty years as an antiquated, rural hermit? Do you think he really believed, twenty years after the fact, that his daughter would ever come back to him? Why do you think Jamie was so insistent upon keeping the truth of her past from Seth? Was it simply because she didn’t want him to know about his terrible genetic legacy? Did Jamie have other reasons to conceal her history? If you were in Jamie’s position, would you tell your child the truth of his family’s genetic legacy, of the 50 percent chance that he has also inherited a devastating terminal disease? Might it be better for the child not to know the truth? If you were in Seth’s position, aware of the possibility that you had inherited the gene, would you get tested for it? Some of the Isidora fables seem to have a clear speaker, while others do not. Why do you think Block chose to make the authorship of these stories ambiguous? What is the effect? How does the genetic history of the EOA-23 variant illuminate the story that takes place in the present tense of the book? How does the scientific details in these genetic-history chapters change your understanding of the book’s characters and their conditions? When we discover that an older Seth is the author of these chapters, does it change the chapters’ meaning as they relate to the rest of the book? What are the consequences of Seth’s “Too-Smartness”? How do his arrogance and intelligence isolate him? How does he use his Too-Smartness to defend himself? How does he use it to help his family? Near the end of Seth’s “empirical investigation,” Taylor Shafer asks Seth what it is that he is really “hoping to find out.” Seth realizes then that his delusions have kept him from “understanding the ridiculously simple answer to this ridiculously simple question” (p. 253). What is the “ridiculously simple answer”? Does Seth find what he is looking for? Describing his mother’s death by Alzheimer’s disease, Abel says, “Her old soul had not so much vanished as eroded, worn away by a million rubs. I stopped praying” (p. 182). How does Alzheimer’s disease complicate or obscure the concepts of death and self?